What Materials are needed to Frame a House? On day ten of construction the semi-assembled frame arrived on skids. Ryland uses a modern construction technique called “panelized construction�. In older or highly customized construction, the walls are built board-by-board by a master framer. Though skilled, these walls can vary significantly from their intended position, straightness, or center construction. Panelized construction is a newer technique where sections of the walls are built in a factory on custom jigs� or templates that allow a high degree of precision and quality control. The framers in the factory ensure that every wall section is uniform, built to code and of a high quality. The sections come made to size and numbered so that it goes in the precise place according to your blueprints. The framed sections are 2x4 construction built on 16 inch centers with OSB (Oriented Strand Board) as the outer wall sheathing. The Windows are already cut and the Engineered Joists are already in place. Framing will begin next. For every house that is constructed, it is important that you know the right type of materials to use in order to get the best results. You may encounter different types of problems when you do not do this. For example, if you do not choose the right type of materials, you may end up having a high risk for accidents. Some of the accidents that you may encounter are electrocution, fire, and water damage. Aside from this, your house is also at risk of early deterioration. The most commonly used home construction material is wood. Among all the materials that will be discussed, wood is the most popular and the cheapest material that is available for framing. Wood has many advantages. Aside from being easily transportable due to its light nature, this material is also a good material for home construction because of its ease to be cut and secured together. Wood has some drawbacks. If you do not coat the material with boron or other protective substances, your wood may end up being decayed before you know it. This is because wood is a porous material. Water can seep into this material easily. Wood can absorb a considerable amount of water and the water can soften the wood, which can lead to faster deterioration. Another material you will need is poured concrete or concrete blocks in order to construct the foundation of your home. Concrete is another commonly used material that is used in home construction. Unlike wood, concrete can resist moisture when properly applied. This is one of the reasons that concrete is used instead of wood for foundations. Using concrete will ensure that the foundation of the home will have enhanced stability and durability in withstanding large amount of stress that can be placed over it. Another material that can be used for the framing of your house is steel. Steel is a combination of two durable metals. This implies that steel is a promising framing material in terms of durability and tensile strength. However, steel is a bit more expensive than materials such as wood and concrete. However, its capacity to withstand factors such as constant water exposure can make up for its cost. Contrary to the common belief, steel can only withstand temperature that is slightly lower than the boiling point. Although steel can be used, this material is more common in commercial construction. Steel girders are sometimes used for support in framing in residential construction. 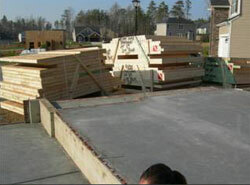 Wood, concrete, and steel are the most commonly used basic materials in framing a house. Choosing the right types of building materials for the framing of your home is an important part of constructing the house itself. This can also save you from a lot of hassle such as the constant replacement of the materials that are used. Because of this, you should not take this step lightly in constructing your house. This will save you a lot of time, money, and effort.